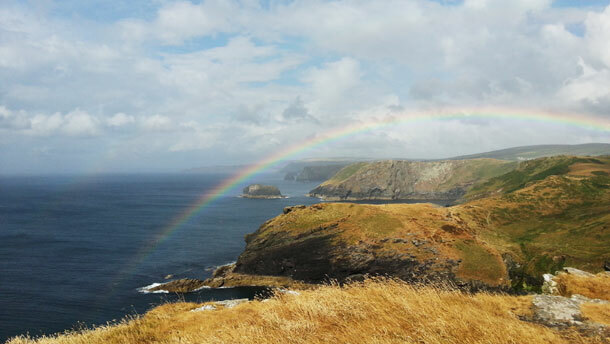 Another week’s escape from commuting, as we visit a part of the Cornish coast I haven’t been to before – the northeast stretch around Tintagel and Boscastle. The cliff walks are breathtaking, there are magnificent deserted beaches accessible only after a steep scramble down rocky paths, and the area is stiff with historical and mythical associations. Lyonnesse is the kingdom of legend where King Arthur supposedly held his court. In writings of the past there is much confusion about its location, but it has mainly been associated with Cornwall, and sometimes the Scilly Isles. 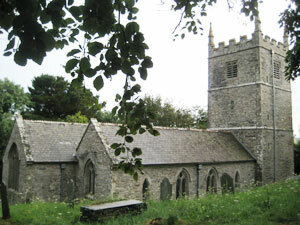 Geoffrey of Monmouth, writing in the 12th century, names Tintagel as the place of Arthur’s conception. Along with many other sandalled, bare-legged tourists we clambered up the hill to the ruined medieval castle, and from the atmosphere and views began to appreciate why it’s a place that has generated legend. But my title is borrowed from the poet and novelist Thomas Hardy. We had arrived at St Juliot’s, a small church outside Boscastle that we’d heard was worth visiting when I suddenly realised, having read Claire Tomalin’s excellent biography a year or two ago, that this was a highly significant place in Hardy’s life. It was here that, in 1870, as a young architectural assistant with dreams of being a writer, he had come to draw up plans for restoration to the church. 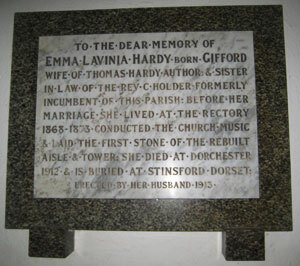 Emma Gifford was the sister-in-law of the incumbent priest and was living in the rectory. We are told that she opened the door to him on his first arrival, and a piece of paper bearing a poem he’d been working on during the journey was sticking out of his pocket. This immediately attracted Emma. Love ensued, and he became a regular visitor to the rectory (a full day’s journey from his native Dorset, Tomalin notes, involving four trains and a 16 mile ride in a trap). The poem whose title I have borrowed celebrates that first trip – it’s short and jubilant in tone, and has him returning “with magic in my eyes”. Although not published until after Emma’s death, the manuscript is dated 1870, the time of the visit. They were married in London in 1874. With Hardy’s career as a novelist taking off, Emma was at first strongly appreciative and encouraging of his writing. 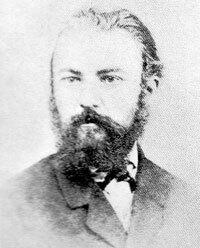 It has been debated how far his early novel A Pair of Blue Eyes was autobiographical, and whether the character of the heroine Elfride Swancourt is based on Emma. While the setting is no doubt drawn from life – Elfride is the daughter of a parson living near the sea, and visited by admiring young men – the parallels are not otherwise close. But there is one surprising scene for the time, where on a coast walk, one of Elfride’s men friends slips on a cliff edge and is trapped, dangling dangerously. However, concealed by the clifftop, Elfride is enterprisingly removing her voluminous underwear and tearing it into strips to make a rope with which she rescues him. They embrace, but overcome with embarrassment at being naked beneath her dress, she flees home alone. Quite apart from the more obvious preoccupations of a young Victorian man, perhaps there is something symbolic of Hardy’s own fortunes here. Later in life, when Hardy’s success as a novelist had become assured, however, Emma became more disenchanted with his writing. She had nursed some literary ambitions of her own, and perhaps there was an element of resentment. But relations became strained and distant in general, and she eventually retreated to an attic room in Max Gate, the Dorset house Hardy had built, and spent much of her time there. In 1912 she died suddenly, and Hardy, overcome with remorse and regret, seemed fall in love with her a second time, this time in retrospect. To the right is my photo of the memorial plaque to Emma he placed in the church. 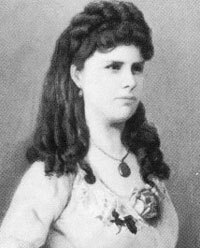 By all accounts Hardy was already close to Florence, his second wife, before Emma’s death, but his posthumous love affair with Emma persisted long afterwards, sometimes to Florence’s irritation. A few years ago a window was commissioned for the church, to commemorate Hardy’s association with it. Rather than being stained glass, the window is engraved, delicately and beautifully, by the late artist, Simon Whistler. I found it almost impossible to capture its quality in a photo; here is my best attempt, which just shows a part. You can see Hardy’s name in the centre pane, surrounding an image of the church itself, and the date of his death on the right, under a representation of his architect’s tools. 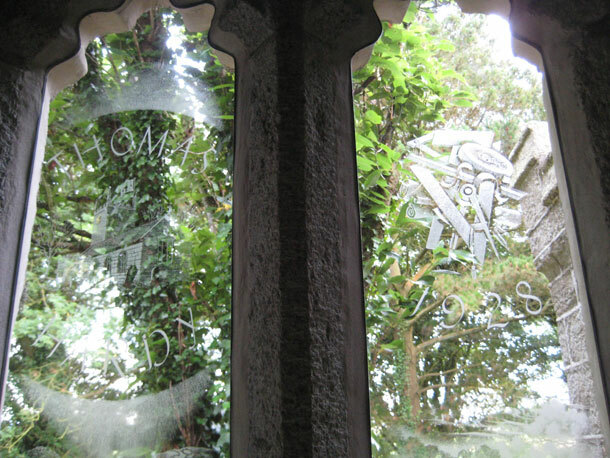 As you view the whole window, symbols and episodes from Hardy’s life shimmer against the backdrop of the graveyard outside, ghostly traces of the events of a century and a half ago. The window also bears quotations from one or two poems inspired by his experiences in this part of Cornwall. In later life Hardy was independently wealthy from his novels, and after Emma’s death he turned to poetry in a way that he hadn’t before. In his collection Poems 1912-1913 he gives vent to his regret and hopeless longing. In a bottom corner of the memorial window are two lines from one of the most well known of them – Beeny Cliff. The window also depicts the figure of Emma on the cliff, astride her pony. Beeny Cliff itself is just a mile or so from the church, and some of our walks along the coastal path took us over it. And nor knows nor cares for Beeny, and will laugh there nevermore.